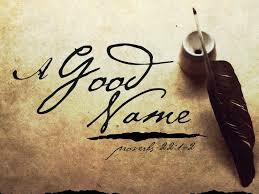 There is a proverb that states "a good name is better than desirable riches." Your words are important. Your actions even more so. And your name, well that is beneficial in many ways but a good name, a solid reputation has to be earned. Proverbs 3:1 My child, never forget the things I have taught you. 4 Then you will find favor with both God and people, and you will earn a good reputation. You don't earn the kind of rep we are talking about today through acquisition of things. It's not even tied to your lineage or where you stack up in society. Earning a good reputation comes from storing up the things that God says and using them in daily living. You have to read or listen to the Bible to keep a surplus of those commands. Faith comes when you hear it and read it. By storing up the Word you become more loyal and kind. These two character traits are non-negotiables in the building of a solid and good reputation. Wrap yourself up each day in loyalty to God, your family and others. Be kind to EVERYone you meet. Take these things to heart. THEN, you will find favor with God AND people and the end result, YOU will earn a good reputation.